C.R.I. MHBS series are compactly designed such that the complete system is mounted on a right base. It occupies less space due to its compact design and maintains even water pressure in all the outlets. 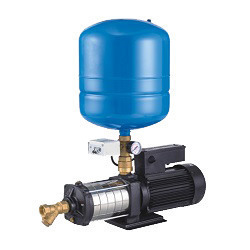 When the pressure drops below a pre-set level the pump will automatically start-up to meet the demand and turns off when the pressure attains the maximum pre-set pressure. Water Pressure Boosting In Individual Houses , Bungalows, Cottages & Villas , Apartments, , Domestic buildings, , Hotels, Hospitals, Farm Houses And Resorts.